Holiday homeowners, now have even more flexibility in travelling efficiently to their property! 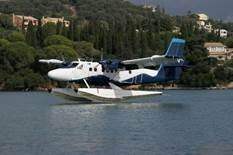 Following the introduction of a new legal framework, seaplane operators may serve Greece’s islands and maritime destinations, as seaports are currently established throughout Greece. Planned routes include services between the mainland, the islands of the Ionian, Cyclades, Dodecanese and other areas. For a detailed view of the seaports network, click here. 7000 words in 30 secs! Best Airport Award for Athens! Greece is a Top Destination for 2014! Navagio Beach: taking the fast lane!